I made this pumpkin/fall cake for my daughter’s 8th birthday. We had a fall theme party since her birthday was in October complete with painting pumpkins and a scavenger hunt so I thought this cake was appropriate. I started by using a half sheet for the bottom and I had a 3D pumpkin cake pan I used for the pumpkin. I made butter cream icing and tinted some green for the grass and used the grass tip. I then tinted some orange for the pumpkin. For the stem I used an ice cream cone and tinted some fondant brown and covered the cone with that. I also made some leaves in fondant using a leaf cookie cutter. 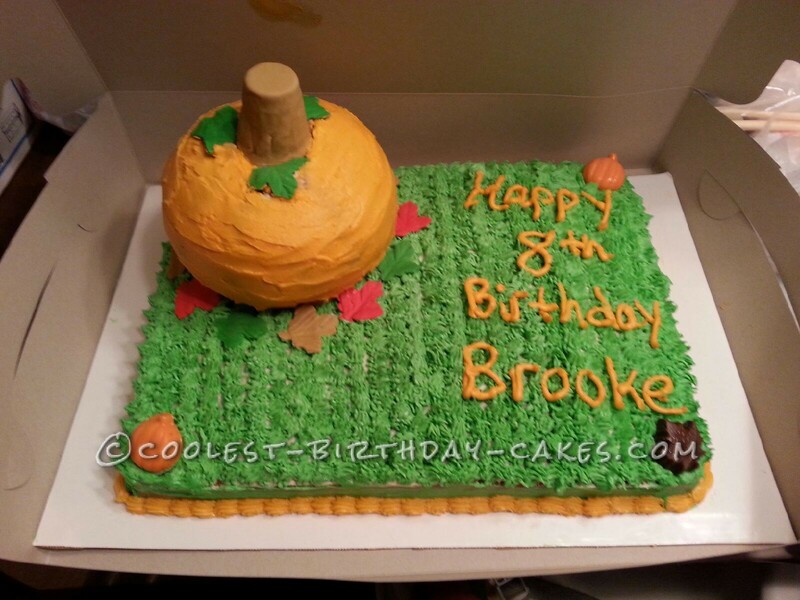 Lastly, the pumpkins and leaves in the corners of the cake are white chocolate made from candy molds. Enjoy! Birthday cake idea Posted by Jenn W.